Japan's Chikyu drilling ship could embark on a journey to the mantle by 2030 at the latest. We'd know a lot more about what's under the Earth's crust if Jules Verne's Icelandic volcano weren't but a figment of his imagination. 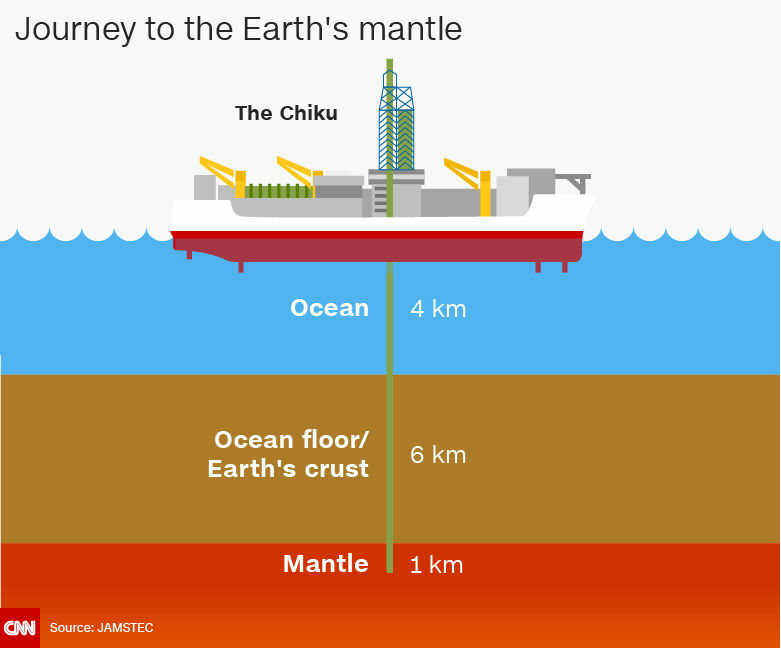 Japan's Agency for Marine-Earth Science and Technology's (JAMSTEC) largest drilling ship called "Chikyu" is very real, though, and a group of international researchers plan to use it to drill into the Earth's mantle for the first time. The JAMSTEC-led team will conduct a two-week preliminary study in the waters off Hawaii this September to determine if that's where their Chikyu should drill. If the location doesn't work, they'll look at their other choices in the waters off Costa Rica and off Mexico. All three are in the ocean, because the continental crust is twice as thick as the oceanic crust. Chikyu's drill will have to go through 2.5 miles of water and 3.7 miles of crust to be able to reach the mantle, which makes up roughly 84 percent of our planet's volume. It's a silicate rocky shell that flows slowly and affects volcanic activity, as well as the motion of tectonic plates that causes earthquakes. The Japanese government is providing partial funding for the project in hopes that it will lead to better ways predict the surface phenomena. As you might know, the country was rocked by some particularly strong ones in recent years. The researchers also want to investigate the boundary between the oceanic crust and the mantle to figure out how the crust formed. Plus, they want to see if microbial life exists that deep inside the planet. The scientists hope to begin drilling by 2030 at the latest. For now, they need to find the perfect location and figure out where to get the $542 million funding the project needs.